And what strikes us most in considering the mediaeval tortures, is not so much their diabolical barbarity, which it is indeed impossible to exaggerate, as the extraordinary variety, and what may have be termed the artistic skill, they displayed. They represent a condition of thought in which men had pondered long and carefully on all the forms of suffering, had compared and combined different kinds of torture, till they had become the most consummate masters of their art, had expended on the subject all the resources of the utmost ingenuity, and had pursued it with the ardour of a passion. However, when one takes a close look at books like these, it soon becomes obvious that very little of the tortures they describe took place in the Middle Ages. Instead, they recount various events from the 17th to 19th centuries, with perhaps a few anecdotes from previous eras (and in some recent books, noting the use of modern tactics like waterboarding). The authors will mention various torture devices, and usually add in some statement that while we first hear about it in the 17th century, it was ‘undoubtedly’ or ‘would have been’ also seen in medieval times. These statements never include any evidence to back up such assertions. Today historians are starting to take a look at these medieval torture devices, and are realizing that they are not only not medieval, but might not even have been torture devices at all. For example, Australian historian Chris Bishop took a look the so-called ‘Pear of Anguish’. The metallic device can be found in several museums, which will note that it is from the Middle Ages despite having little idea where their particular item comes from. Typically, this pear-shaped item has a latch at its tip, which when triggered will open the spring-loaded lobes. The lobes can then be screwed back together with a key. One could imagine them as surgical instruments – some sort of speculum perhaps, or a device for levering open the mouth in order that a dentist might operate. But then they could just as easily be shoe-extenders, or sock-stretchers, or glove-wideners. This is the point, then, at which a curiosity is being transformed into something much more nefarious. No longer the unique prototype of a singularly depraved mind, by the 1860s the ‘pear’ has become a member of a darker taxon. By misconstruing the function of the device itself and by mistaking the key that unlocks it for a screw to manipulate it, the emphasis of operation has shifted away from a purely mechanical function to the slow and deliberate application of pain. In this taxonomy, the ‘pear’ can only be used to torture. The Iron Maiden of Nuremberg – this artefact was destroyed during the Second World War, but by then historians knew it was a fake. It is likely that Siebenkees just invented this story, but by the early 19th century the Iron Maiden was being displayed in Nuremberg and other places. One of them was even exhibited at the World’s Fair in Chicago in 1893, which furthered its reputation. Even though the Iron Maiden of Nuremberg was deemed a fake, it still has a reputation of being a real medieval torture device, one that some books claim was used as far back as the 12th century. As one takes a look at the real history of these so-called torture devices, it becomes clear that few had anything to do with the Middle Ages. In some cases they were inventions from more recent times, and others are actually from the ancient world. The Brazen Bull is commonly included in lists of medieval torture devices, despite the fact that it was reportedly created in the 6th century B.C. The Rack also was well-attested in ancient times, but it has now become synonymous with the Middle Ages, where some imagine that every castle had one in their own dungeons. You can see one of these specimens at the Tower of London (where it is displayed with other torture devices) and there is a reference to one being there in the year 1447. However, we have no other references to its use during the Middle Ages, nor of anything similar to it in the rest of medieval England. This does not mean that torture did not exist in the Middle Ages – it certainly did, and by the later medieval period was considered a legal practice for obtaining a confession. However, medieval people were just not as imaginative and creative as modern day people believe. Instead what little we know about torture methods suggests that fairly simple methods were used, such as binding people very tightly with ropes. Some so-called torture devices, like the Pillory, actually did little to harm individuals. It was used by city authorities in medieval London, for instance, to punish various criminals. For example, several bakers who committed fraud were sentenced to spend a few hours bound up in the pillory, where they had their fake bread burnt under them. This punishment was intended to humiliate and expose the wrongdoer – physically they received little harm, perhaps some sore muscles and a bit of smoke inhalation (depending how much smoke a loaf of bread could create). Convicted women also had the benefit of being able to use a stool when they were sent to the pillory. 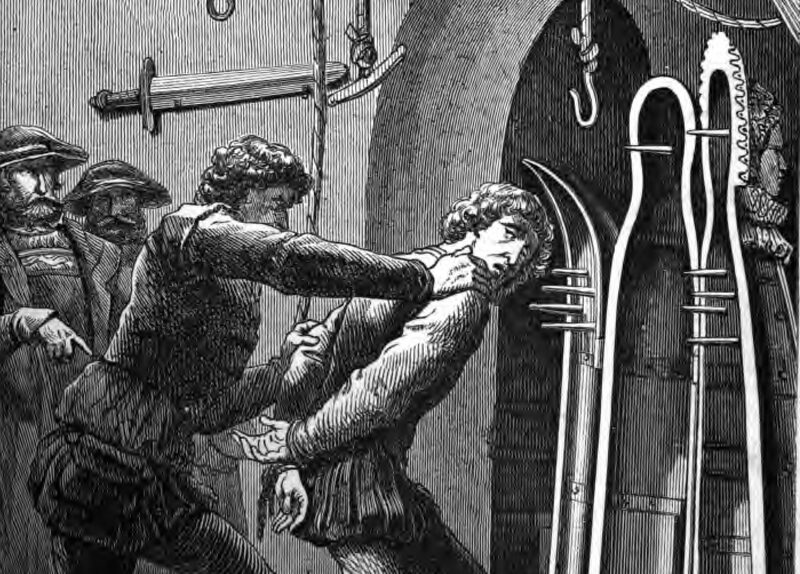 Our modern notions about medieval torture devices reflects other misconceptions we have about how torture was used in the Middle Ages and how widespread it was during that period. Perhaps, because we want to see ourselves as more civilized and intelligent than people who live hundreds of years ago, we will imagine that they were more eager to torture people and do it in a more cruel fashion. Therefore it allowed us to be convinced that devices like the Rack, the Iron Maiden, and the Pear of Anguish were somehow everyday objects of the Middle Ages. It might say more about us than about our medieval ancestors. Top Image: An 1868 depiction of the Iron Maiden.